Flight number for the day of the event is 8240. The following details are very important and will assist you in preparing for the program. •Your arrival time at The Arc of Kentucky/Feat registration area is 10:15 a.m. This will allow you to get your backpack, t-shirts, and parking validated. You will then proceed to Delta Air Lines Ticket Counter. You will obtain your boarding pass, pass through Transportation Security Administration, and be at the gate area before boarding. •The event will take place in Concourse A of the SDF Louisville International. You can park in the Parking Garage Under 4 Hours. Look for volunteers from the Wings for Autism program who will direct you to the registration area. •There is no charge for parking, but your parking ticket will need to be validated at the registration desk. •When you arrive at the Delta Air Lines ticket counter, you will receive your boarding passes. 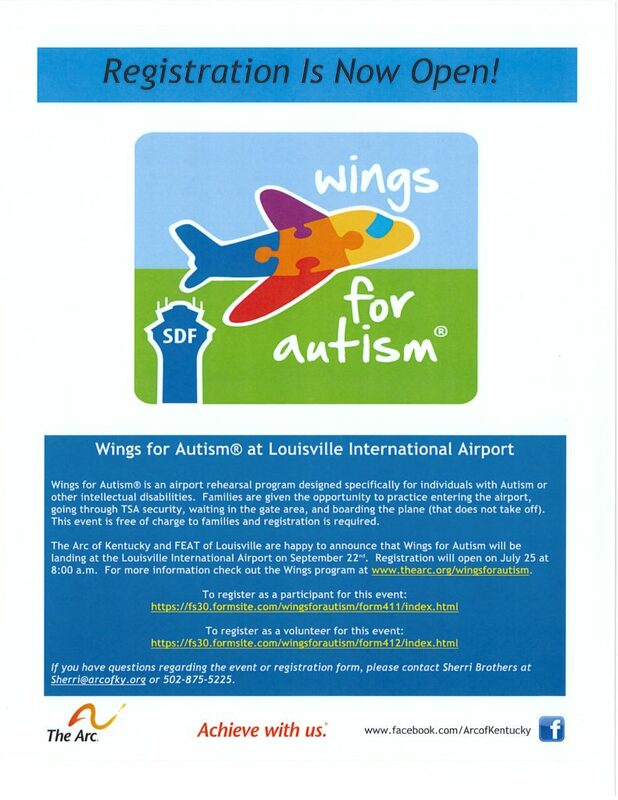 Look for the Wings for Autism® logo displayed on signs and monitors. •Media (press/photographers/videographers) will be present at this event. •Only people who have registered will be allowed to participate. This is due to TSA security regulations. Please do not bring people who are not registered for the event. No substitutions will be permitted the day of the event. Boarding passes are printed ahead of time and cannot be changed. We want this to be an enjoyable experience for all families who attend.